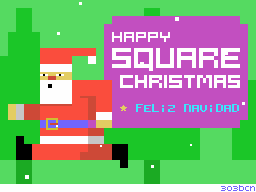 Home » News » Software » Happy Square Christmas! For all the fans of 8-bit computing, developer group 303bcn has created a Christmas wish in MSX demo style, programmed in C (SDCC) + ASM. Apart from this screenshot, a sneak preview can be watched at YouTube. Now this is cool way to celebrate Christmas! bit late reply but: Nice!